Michael Elliot interviews Nassim for TIME Magazine back in December 2010 for the release of his book The Bed of Procrustes. Evidently it was just 5 questions, nice work TIME at least you delivered half of what you said! Taleb tries to inform a group of economically ignorant legislators. Congress is completely clueless in regards to simple concepts such as “risk”. Taleb mentions that our society is “over-financialized” because debt to GDP has grown to unsustainable levels and that our children and grandchildren will be punished for the foolish risks that government has taken with deficit spending, drastically increasing public debt, and central planning. Unfortunately Congress has not listened and continues to spend, as they are naive enough to believe that throwing money at our problems will solve everything. Taleb wants to suspend VaR, however that is only one minor issue. The major issue at hand is Congress; how Congress facilitates, encourages, rewards, foolish and disastrous behavior. Congressional oversight of the Federal Reserve Bank and Ben Bernanke is non existent. Congressional oversight of Housing and Urban Development is non-existent. Congressional oversight of MLB players accused of using anabolic steroids is absolutely exceptional. Luckily, Congress is there to prevent the world from losing interest in something as significant as baseball. If anything will bring about hyperinflation and/or a world wide catastrophe, it is baseball and the lack of oversight. Don’t worry about imbeciles like Paul Volcker and Alan Greenspan… go after Curt Schilling! Forget about those who created the housing meltdown and the Great Recession… forget about Andrew Cuomo, Bill Clinton, Franklin Raines, Jamie Gorelick, Jim Johnson, Rahm Emanuel, Chris Dodd and Barney Frank​… go after Roger Clemens! Forget about unfunded liabilities in the ten of trillions – and perhaps hundreds of trillions – created by Ponzi Scheme policies… go arrest Mark Mcgwire! May 5, 2009: The next 100 days. Nick Paumgarten hosts a panel on the financial collapse with Nassim Taleb and Robert Shiller. Presenter: Show of hands, who thinks this will be repeated? Why is that? 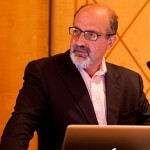 Nassim Taleb: Can I tell you what’s happening? This happened in the past, it keeps repeating itself. We keep bailing them out. The only way this will not be repeated this if you have punishment. The only place in which you had punishment is here switzerland, they went back and clawed back the bonuses. Until we do that we will always live under moral hazard from banks. Presenter: So the leaders who were in charge taking on that risk, selling those complex products, should give money back? Nassim Taleb: Yes, there is a gentleman who is a government official Bob Rubin. I think he pocketed 150 Million dollars from Citibank. Now I don’t know how many American tax payers we have here but we are paying for that. That should not happen again but it had happened, it has happened several times in history, unless you have punishment you will never be immune from these abuses. Presenter: So the bonuses for the last how many years? 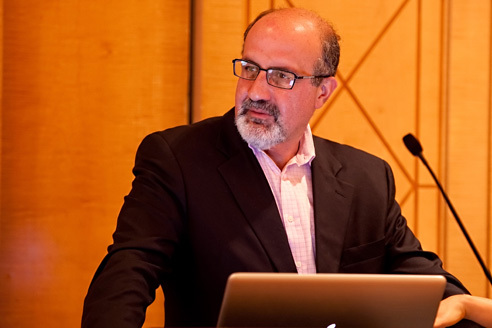 Nassim Taleb: I don’t care, whatever, something. In Switzerland they settled it. They did it very properly and very responsibly. This is the only country here, Switzerland that acted responsibly. Nassim Taleb & Benoit Mandelbrot on PBS Newshour talk about the current ecology of the financial industry during 2008 Financial Crisis (Air date October 21, 2008). As the financial sector shifts, so does the reach of the jolt to economic structures around the world. Economist Nassim Nicholas Taleb and his mentor, mathematician Benoit Mandelbrot, speak with Paul Solman about chain reactions and predicting the financial crisis. A peculiar video on YouTube titled “Nassim Nicholas Taleb” and only coming with the vague description: “Tips on life from a man who’s done a lot of thinking and knows a lot of people.” It is not clear who this video is from, possibly Nassim himself but unlikely, probably more likely a friend/acquaintance. As he describes at the start it is filmed at Heathrow Airport Terminal, a place he often criticises for being terribly designed and over optimized, the planners obviously having no appreciation of the non-linear effects of congestion.